GOCare provides two-way access to Alsat WIreless customer account information through SMS messages. Information accessible through GOCare includes Balance, Payment Due Date, Payment Confirmation and Account Changes. This service is simple to use and available on any wireless phone. If you can open a text message, you can use GOCare. 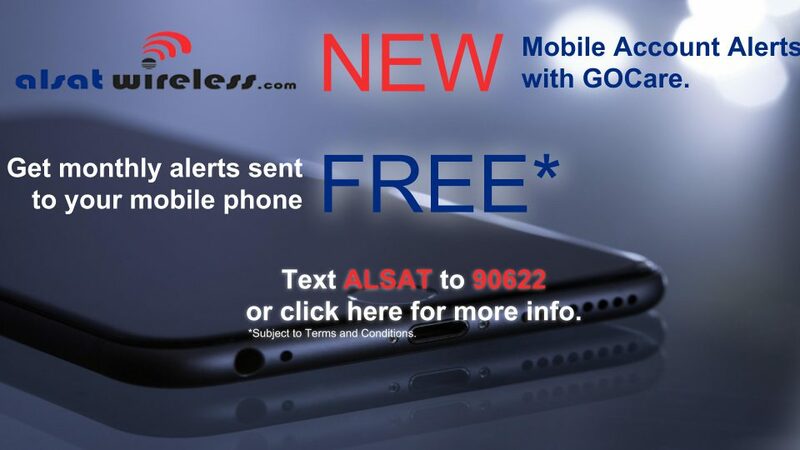 GOCare is a free service from Alsat Wireless. However, a customer’s mobile service provider may charge the mobile user to send/receive text messages depending on the terms of their mobile account. ALSAT: Text ALSAT to 90622 to initiate the Opt-In process through your mobile phone. You will be asked for the Last Name and Last 4 Digits of Phone Number on the Account for Verification. APPT: Text APPT to 90622 to receive a text message with any scheduled appointments you might have. You may then CONFIRM or CHANGE your appointment. GOCare is a mobile account alert platform proactively delivering account information (statements, balance, due date, payment confirmation, appointment reminders, and more). Information can be initiated by either Alsat or the Customer with the use of “KEYWORDS”. More information can be found at our website at https://www.alsatwireless.com/alerts. GOCare is faster and easier than calling the call center or logging on the website. GOCare allows you to make payment securely via your handset. Will I constantly be getting messages from Alsat? initiate any of these inquiries by using the KEYWORDS shown below. Conditions. Customers can opt-out at any time by texting STOP to 90622. Why should I encourage customers to use GOCare? Customers have shown an overwhelming preference to communicate via texting. Alsat competes for customers EVERY day. Anything that helps differentiate us helps bring in new customers and keep the ones we have. Alsat takes many calls each month from our customers. Simple inquiries on – balance, payment due date & posting – are not (really) necessary. Alsat can spend more time with customers with more complex issues that do require a call. GOCare can also deliver a payment confirmation as a written record and late payment reminders to customers quickly and conveniently. How do I Opt-In (after I opted-out)? Does Capitalization matter when I am texting to the Alsat? No. GOCare recognizes upper and lower-case letters as the same. How do I Opt-Out of or stop receiving the GOCare message alerts? Which wireless carriers support the GOCare text message service? Virtually ALL domestic wireless carriers support the GOCare service offering. For the most current list of those carriers, please see Alsat Terms and Conditions.